"One Sweet Beach Retreat" is a gorgeous oceanfront beach house is located in the prime of Panama City Beach. Enjoy amazing views of the sugary white sands, and the emerald waters of the Gulf of Mexico from the back deck, or balcony, in this luxury vacation rental. One Sweet Beach Retreat gives a quiet escape from reality feel, yet a short walks distance to several local hotspots and family fun! Click on the virtual tour button above to see what this home is all about. Families can take advantage of One Sweet Beach Retreat's relaxed feel. This beach home boasts an astonishing 6 bedrooms and 6 baths plus media room with a queen sleeper sofa! Guests will also enjoy the perks of a full service kitchen, an outdoor grilling area, and a splash pool. One Sweet Beach Retreat features 8 flat screen TV's (one in every bedroom), digital cable, and free WIFI. Guests can enjoy stainless steel appliances, lush bedding, and amazing beach decor. This property offers all the luxuries that are desired in a beach getaway while providing all the comforts from home. Enjoy the gas grill on the back deck overlooking the Gulf of Mexico with an outdoor picnic table for dinner and sunset. Let the kids enjoy the splash pool after a fun-filled day on the beach. There is open space for family entertaining, and the added media room bonus for separate TV programming can accommodate the kids while adults enjoy downstairs. 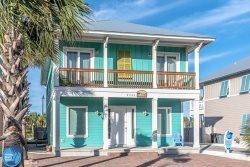 One Sweet Beach Retreat proves to be a fun filled family vacation rental, a quiet getaway, a ladies retreat, a wedding or event location, or simply a fun filled week while attending a Panama City Beach special event. Time to escape to the beach! The first floor of the home is the main area featuring bedrooms, bathrooms, kitchen, living area, washer/dryer, and back deck. As you walk in the first level has one king and one queen bedroom, each with flat screen TV's. The king bedroom features its own private bathroom with a double vanity and walk-in shower. As you near the living area, there will be a full bathroom with walk-in shower and a laundry room with a sink and full sized washer/dryer. When exploring the home you will notice a great open floor plan that makes gathering in the kitchen, living room, and dining area perfect for the guests. There is a fully stocked kitchen with stainless steel appliances and bar seating for four. The dining table will seat 8 guests and the cozy living room has space for guests to sit and relax as well. Although there is a flat screen TV in the living room, the mesmerizing sunrise and sunsets off the back deck will certainly catch your eye. The furnished deck is the perfect place to sit and look at the beach. The second floor of the home has a separate living area, with a Queen sleeper sofa, to watch TV and relax. There are four bedrooms on this floor, sleeping a total of 14 guests. Down the hall you'll find a twin bunk bed room, with futon, and adjoining bathroom and walk-in shower. Across the hall is a bedroom with two full sized beds, en-suite, and flat screen TV. At the end of the hallway is the two King master bedrooms. Both bedrooms have flat screen TV's, en-suite bathrooms with walk-in shower and double vanities, and best of all, access to a furnished, ocean view, balcony. These rooms offer direct access to sit and watch the beautiful ocean of Panama City Beach. When I say perfect, I mean perfect. From the first time I contacted Holiday Beach Rental, my search for a vacation rental became so much easier. The staff was so kind in helping me find the perfect beach house for our large group! We found perfection with this house. Every couple ended up having their own private room and almost every room has their own bathroom attached. The views were gorgeous and the house equally as beautiful. The house had everything we could have possibly needed. Many restaurants and bars were in a short walking distance but far enough away from the "Hussle and Bussle" to truly relax! We unanimously decided we would be making this an annual trip and we wouldn't think of booking with any other company! Holiday Beach Rentals are the best rental company I've ever had the pleasure of working with and we will be using them from now on! Thank you so much Holiday Beach Rental for our truly perfect accommodations! -Tiffany L.
What a great place to spend our vacation! Love the area and the beach house was spectacular!! Looking forward to next years trip. Thanks for everything. Loved this beach house so much, we came back! Beautiful home, roomy, right on the beach, great location and great amenities. A true gem! I'm sure we'll come back again. As a first-time 'beach house' renter, I couldn't have been more pleased. All 8 adults in our party raved about the great decor (as pictured), cleanliness, amount of space, and beach-front access/views. I could have invited more people. Thanks for the sharing. Hoping for a repeat stay.